I'm not entirely sure how accurate that is because UZR has him all over the place for his career at third. But I like to throw out blanket statements, so there. Andy Marte summed up the past couple of Indians' seasons in the first inning against the Red Sox tonight. Marte managed to commit three errors almost effortlessly. Or exactly effortlessly. This is the first time a player has committed three errors in one inning since 8/30/2007. Marte's first error came of the bat of Kevin Youkilis. Marte bobbled the ball allowing Youk to reach first. Later in the inning, Marte booted a ball hit by Mike Cameron and, after tracking it down, threw it wildly to first. The ol' two errors in one play. Tough to top unless you can manage to have the ball ricochet off your head for a homer. Marte did go 2 for 3 with an RBI and a run scored before he was pinch hit for in his first game back since returning from the disabled list. Maybe he should have spent an extra day on the DL. 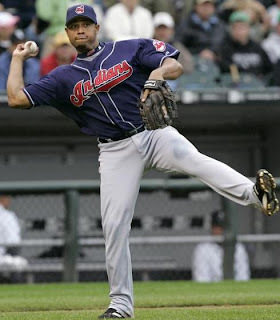 Oh, and Derwood, being a Yankees fan and all, wanted me to let you know that Andy Marte is one of his favorite players.